DUBAI: Pakistan lost their last five wickets in just 17.3 overs after dinner as Sri Lanka established a first-innings lead of 220, and in doing so, taking their opponents by the collar. As had been the case in the morning session, Sri Lanka’s bowling had been decent, but nothing that warranted the kind of collapse Pakistan have experienced. They surrendered their last six wickets for 82 runs – losing four of those to spin, and two to seam. At the end of the innings, Sri Lanka’s bowlers had shared around the rewards. Dilruwan Perera and Rangana Herath had three wickets each, while Suranga Lakmal and debutant Lahiru Gamage took two apiece. Though Dinesh Chandimal had failed to reprieve himself with a review while batting on day two, he displayed a half-decent knack for reviewing on day three. Two of wickets came from overturning umpires’ decisions. It was Sarfraz Ahmed who set the slide in motion soon after the dinner break. 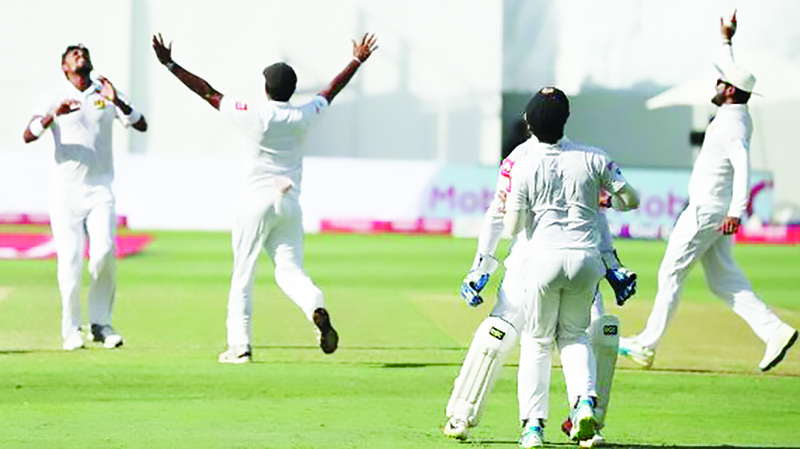 He had come down the track to clatter Herath back over his head not long after play resumed, but an attempt to lap sweep Dilruwan Perera in the next over resulted in him gloving one to a backtracking short leg. Haris Sohail attempted to score quickly, with only the tail for company now, but he soon lost Mohammad Amir lbw to Herath, and before long, was trapped in front of the stumps himself, by Perera. But he had, by that stage, made 56, his second half century in three Test innings so far. From then on, it was only a matter of time. Sri Lanka took the second new ball after 85 overs and the seamers would promptly claim the remaining wickets. Wahab Riaz was caught at short leg, after a ball from Gamage brushed glove, then popped up off his thigh pad. Yasir Shah, who had thumped two sixes, was bowled by Lakmal attempting to hit a third.